There we have it. Arsene Wenger straight into business at the end of the season and signs a player we all knew was making the move to north London anyway. The Finnish FA confirming what Arsenal are yet to, that Carl Jenkinson has joined the club. I get the impression we won't get an official announcement from the club until July 1, when Jenkinson becomes a free agent when his deal with Charlton expires. He's not the most inspiring first signing, but if this is any sort of indication Arsene Wenger will be busy this closed season I'll be happy. Jenkinson is a defender who primarily plays at right back but can also play in the middle as well. He's 19, has a duel English/Finnish nationality and will be classed as a home grown player. One down... countless to sign. As expected Samir Nasri has as expected been handed an ultimatum by Arsenal, according to the Daily Mirror sign a new contract or be sold. The offer is £90k a week for five years. I'm sure there are bonuses and incentives to add on as well. 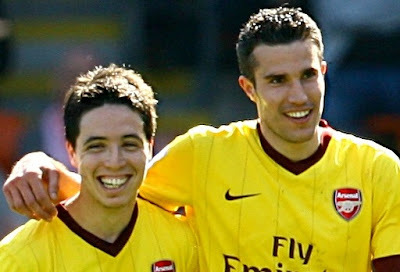 But I bet Nasri's agent is telling him he can earn more elsewhere. It all comes down to money. And if Nasri's agent has had contact with Manchester City, Bayern Munich or Inter Milan they will no doubt be trying to get him to advise his client not to sign and move on a free with a bumper signing on golden handshake and a weekly wage which would dwarf what we can afford. As much as I've enjoyed watching Nasri develop this season - and I would love to see him stay - I don't think he's been consistent enough to warrant huge wages. If he'd continued his form from the first half of the season into the second we would have won the league. But for what ever reason he just hasn't been the same player. I can't at this point in time see him renewing his contract and think he'll be sold. If that means starting an auction for his services then so be it. We have to get the highest possible fee to reinvest into the squad. Another player likely to receive the same deadline is Gael Clichy. Again it's down to money and he was very close to deciding that he'd move away from the club last summer. However the club refused to budge when a bid was made for him and Clichy was in the end happy to stay. Kieran Gibbs is yet to progress on his promising early showings and whilst there is complaints from fans about Clichy as a defender, the Frenchman is still the best left back at the club. Gibbs hasn't forced Clichy out of the side yet and for me that is a telling sign that he's not yet ready. The Englishman's performances at the end of the season offered me little hope that he'll be ready to start next season as first choice. Arsene Wenger has got a tough call on his hands when it comes to what to do about his countrymen. But I can't see the club bowing to their wage demands. At the highest level of the club, Alisher Usmanov has been snubbed by majority shareholder Stan Kroenke. The Uzbek had requested a face to face meeting with the American over his future role within the club's hierarchy. According to the Daily Mail, the Uzbek billionaire is also offering up £14,000 a share to small shareholders. It seems the fight to own Arsenal shares will continue throughout the summer. There are a few transfer rumours doing the rounds. The Sun link us with a £35m move for Karim Benzema, the Real Madrid striker. "Signing him does not seem impossible. He's a player that I like. "He's intelligent in his movement, he is capable of combining well with others and making a difference, and of doing individual moves as well. "So, for me, he's a player who's at the top level in the world." It will never happen, not at the price mentioned. And where would he fit into our system? If Robin van Persie is fit, Benzema's likely to only get Nicklas Bendtner's place on the bench. The Daily Mail have linked us with Porto striker Radamel Falcao, because they say he's refused to sign a new deal. They say the Colombian forward is rated at £25m. The other forward we've been linked with in recent days is Ricky Alvarez. The Argentine has been linked with a move but the situation from both continents has been very quiet. The league in Argentina doesn't finish for another month, so any deal won't be announced until then. Is our interest real? I don't know. The question I'm left asking myself is how he'd get a work permit to play in the Premier League. He's not a full international and our attempts in the recent past to get exceptional talent visas (Wellington and Miyaichi) haven't been successful. However he does fit the bill as a possible Wenger signing. An unknown who is exceptionally gifted. I think it's a case of watching this space. Update: My good readers have informed me that Alvarez has duel citizenship and has an Italian passport. No work permit issues then! There has been considerable consternation in the Gooner community that Arsenal have given permission to Barcelona for them to train at London Colney ahead of the Champions League final on Saturday. The Spanish champions are paying for the privilege and hardly any of our players are there. So I don't see the problem. Cesc Fabregas has gone to America with Robin van Persie, having spent yesterday at the training centre getting treatment for his injury. Many of the staff at Colney have gone on holiday, so Cesc along with Lukasz Fabianski felt a bit lonely. And finally, don't read too much into Andrey Arshavin training at Zenit St Petersburg's facilities in Russia. It doesn't mean he'll be moving back there. It's just where the Russian national team train.